Founded in 1987, Gilead Sciences (GILD) is one of the world’s leading biotech companies. The firm operates in more than 35 countries worldwide, researching, manufacturing, and distributing various medications to treat HIV/AIDs, liver diseases, and immune, respiratory, and cardiovascular diseases. In 2018, Gilead’s total sales declined 15%, causing its net income to fall by 26%. The main culprit was continued declines in its hepatitis C drug franchise (down 59% in 2018) which the company helped pioneer modern treatments for with Harvoni and Sovaldi. Since these drugs cure patients after one course of treatment (and have faced many rival drug launches in recent years), they have rapidly lost market share. Gilead’s new HIV medications have only been able to modestly offset these large scale revenue declines. Going forward, Gilead hopes to diversify into oncology (cancer) treatments, thanks to its 2017 purchase of Kite Pharmaceuticals, a leader in the field of T-cell cancer therapy, for approximately $12 billion. As of February 2019, management expected Gilead’s overall 2019 revenue to be about flat compared to 2018. However, if a drug is approved and successful, then the long patents granted on these high-margin medicines mean that drugmakers can be free cash flow machines. For example, despite its falling margins and 59% decline in 2018 hepatitis C drug sales, Gilead’s free cash flow margin was still an impressive 37% thanks to the 85% gross margin earned by its patented drugs. Gilead’s strong margins are also a result of its lean operating structure. For example, the company has a relatively small but highly specialized salesforce. In addition, Gilead’s manufacturing is highly automated which gives it relatively low production costs to further boosts its profitability. Gilead’s management team (all PhD’s) is a major factor behind the firm’s success as well. One example is the incentive system used for variable compensation. Management bonuses are tied to R&D targets, not short-term financial results, helping to promote long-term strategic decision making. However, 2018 saw some turnover with CEO John Milligan, who had spent his entire 28-year career at Gilead, announcing he would step down as CEO at the end of the year. In December 2018 Gilead announced Milligan would be replaced by Daniel O’Day, who had served as the CEO of Roche (RHHBY) for six years. However, Gilead’s turnover at the top wasn’t just limited to its CEO. The company also faced the departure of its Chief Science Officer in April 2019, and then its Chief Medical Officer in September 2018 (after just five months on the job). What might explain the high executive turnover for Gilead, who has relied on a strong core team of executive PhDs to guide its capital allocation? Most likely it comes down to the company’s multiyear struggles with its hepatitis C franchise, which it came to dominate after its $11 billion purchase of Pharmasset in late 2011. Over the past five years, those hepatitis C drugs have totaled nearly $60 billion in high-margin sales for Gilead, driving a surge in the firm’s revenue through 2015. In fact, in 2015 sales of Sovalid and Harvoni alone accounted for 60% of Gilead’s total revenue. But as you can see, since peaking in 2015 Gilead’s revenue (and profitability) has steadily declined due to the rather unique nature of hepatitis C. Unlike most diseases, which are chronic and thus require a patient to continually take medications (sometimes for life), hepatitis C is a “one and done” disease. In other words, the near 100% cure rate from Gilead’s drugs (usually two to fourth months of treatment) results in a patient pool that declines over time. What’s more, rivals like AbbVie (ABBV) have created similar (though sufficiently different to not violate Gilead’s patents) versions of hepatitis C drugs such as Mavyret, which has since gained about 50% global market share for hepatitis C due to lower pricing and even higher effectiveness, according to AbbVie executive Bill Chase. Gilead’s HIV franchise (67% of sales), despite some successful launches and steady growth, competes in a rather saturated market where strong enough growth to offset the huge declines in hepatitis C revenue is not possible. Gilead’s business began blossoming here in 2003 after it acquired Triangle Pharmaceuticals for $464 million to add HIV drug Emtriva to its portfolio. That drug became the cornerstone of the company’s single-pill HIV medications. Emtriva is called a Tenofovir Alafenamide, or TAF-based medication, and was one of the first forms of today’s state-of-the-art anti-retrovirals meds that Gilead has leveraged into such blockbusters as Truvada (the only approved preventative treatment for HIV), Genvoya, Atripla, and its latest breakthrough, Descovy. These drugs ultimately allowed Gilead to become the world’s most dominant HIV medication provider, with leading market positions in the U.S. and Europe. In fact, Gilead has more than 80% market share of HIV meds in the U.S. and over 75% globally. HIV medications are Gilead’s largest and steadiest source of cash flow. Not only have these drugs proven to be some of the most effective in the world (with superior safety profiles), but they must be taken every day for life. In recent years, Genvoya and Odefsey began offering patients a single daily pill with fewer side effects. And in 2018, Gilead launched a new class of drugs (via Biktarvy) that are the world’s smallest single-pill regimen, with studies showing 0% viral resistance (it remains effective far longer than existing medications) as well as much improved kidney and bone safety profiles. 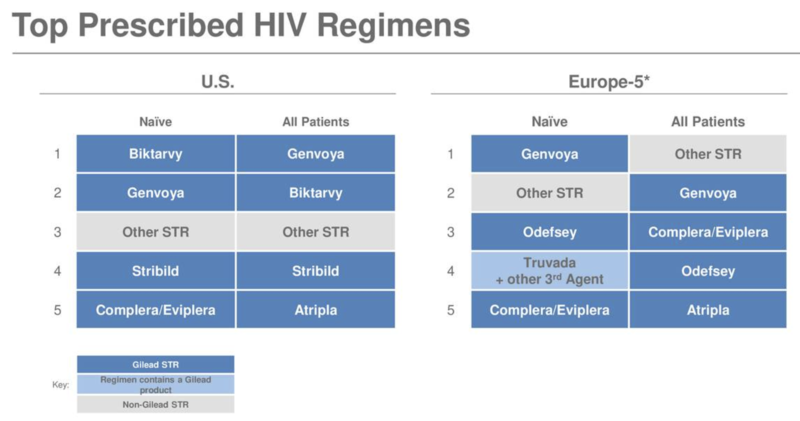 Biktarvy has only been on the market since early 2018 but already achieved $578 million in fourth-quarter 2018 sales, representing 10% of Gilead’s total revenue. As you can see, Biktarvy is already the No. 1 prescribed regiment for treatment-naïve and switch patients in the U.S. and is quickly establishing itself as a leader in a number of European countries as well. Gilead’s dominance in HIV breakthroughs is why the firm remains the undisputed king for treatments of that chronic disease. But with such high market share, Gilead’s continued breakthrough in HIV drugs merely help it maintain its leadership position since most patients switching to its newest drugs are switching from other Gilead medications. Meanwhile, the company’s earlier spike in revenue from hepatitis C drugs is proving unsustainable because the addressable market has shrunk, due to the company’s success in curing so many patients. Thus, despite expansion into new markets such as Japan and Europe, new patient starts have continued to decline. 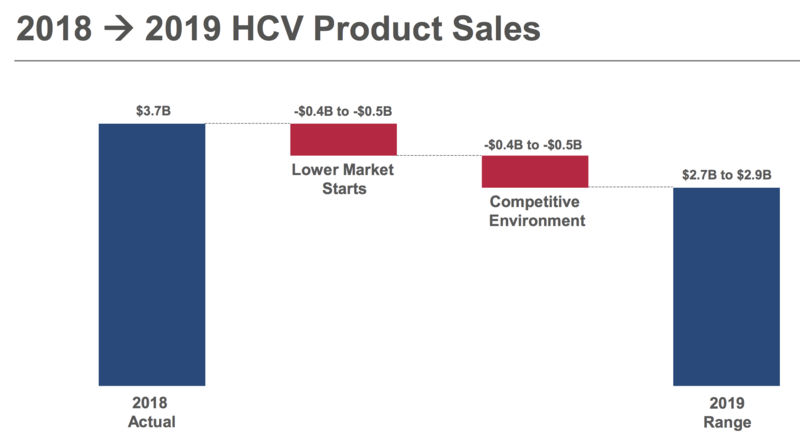 With hepatitis C sales still trying to find a bottom, and Gilead’s $15 billion HIV franchise serving as a stable but relatively slow growing base, the company will eventually need to find a new growth engine. After all, its dividend payout ratio is already around 40% of free cash flow, and with cash flow still declining that metric may end up hitting 50% before hepatitis C sales finally stabilize. As a result, Gilead’s dividend growth potential will come down to the firm’s ability to find success in new treatment areas like oncology, the new focus for the company. This is where the hiring of Roche’s CEO Daniel O’Day comes in, to try to lead a new management team with a focus on cancer drugs, which research firm EvaluatePharma estimates is the single largest and one of the fastest growing drug markets. Gilead’s turnaround plans rely heavily on making wise acquisitions, which is the lifeblood of the pharmaceutical industry. The high amount of new drug failures (around 90% fail) and steep development costs mean that no company can rely exclusively on organic growth (via its development pipeline) to offset the patent cliffs that are baked into this industry’s business model. That’s why since its first acquisition in 1999, Gilead has purchased 14 companies and has one of the industry’s best success records in mergers. Gilead’s last big deal was in 2017 for Kite Pharma, which it bought for its strong pipeline of CAR-T cancer drugs. Currently, Kite’s CAR-T treatments represent eight potential drugs/indications for Gilead, though only account for 1% of sales due to a single new drug that launched in 2018. CAR-T is a T-cell therapy, in which a patient’s own T-cells (part of the immune system) are extracted and then engineered to contain antigens against his or her specific tumor. All cancers are genetically unique, which means that doctor’s don’t know how much radiation or chemicals it might take to kill a tumor. That’s why traditional chemotherapy and radiation treatment can result in such severe side effects. Doctors are literally poisoning the patient in hopes that faster-growing cancer will die first and the treatment can be stopped before the patient’s health falls below recoverable limits. However, with T-cell therapy, the patient’s own immune system will target the tumor directly, hopefully curing the patient of cancer. Since T-cells are part of the long-term immune system (that recognize invading antibodies), once a patient is cured with T-cell therapy, then they should also enjoy a long-term immunity from that particular cancer. Or to put it another way, Gilead’s acquisition of Kite Pharma brings with it a potential cure and vaccine against patient-specific cancer. Unfortunately, Kite’s cancer immunotherapy drug has not grown as fast as management hoped. Management expects better performance in 2019, but there are no guarantees in the biotech business. In total, Gilead’s drug pipeline consists of 29 new drugs/indications, which it hopes to get approved in the coming years. In theory, Gilead has the potential to be a decent long-term dividend growth investment. However, while the company has some positives in its favor, there are also numerous complex risks to understand. For example, Gilead’s NASH drug Selonsertib has a very important drug trial expected to be completed in the second half of 2019. While initial results are promising, there is no guarantee that the drug will actually make it to market. Management teams and analysts don’t have a crystal ball, which can make these stocks volatile as long-term growth expectations oscillate. For example, Genvoya, Descovy, and Odefsey, Gilead’s top HIV drugs which represent 35% of sales, start to lose patent protection in 2021 and 2022 (patent expiration has already begun in Europe). As this plays out, generic versions of its drugs could meaningfully decrease its HIV sales starting in a few years, especially since both GlaxoSmithKline (GSK) and Johnson & Johnson (JNJ) are developing or have already launched competing medications. These patent expirations (which drive the very high R&D budgets in the industry) are why Gilead’s HIV franchise sales are expected to peak at approximately $18 billion in 2021 (from about $15 billion in 2018) and then start declining as a wave of cheaper generic rivals enters the market. With nearly 70% of the firm’s revenue tied to HIV treatments, Gilead could struggle to deliver meaningful sales, cash flow, and dividend growth over the next five years. One possible solution to the firm’s lackluster growth potential is acquisitions, specifically those focused on oncology and NASH. At the January 2019 JPMorgan Healthcare conference, Gilead CFO Robin Washington told analysts that the company is “looking at lots of opportunities” for potential acquisitions in promising CAR-T and NASH therapies. Of course, all such deals carry the risk of overpaying for a company whose promising drug pipeline might not work out. Fortunately, Gilead’s net cash position (more cash than debt) and strong “A” credit rating mean it’s among the best-positioned drug giants to make a major acquisition. 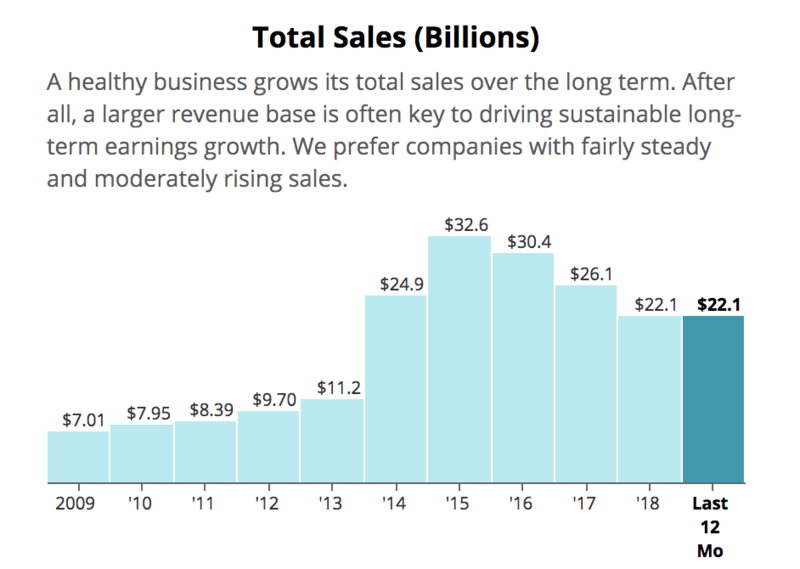 Just remember that the company is now led by a new CEO whose M&A track record at Roche is relatively skimpy compared to the executives that have previously been leading the company. Then there’s the ever-present risk of Federal healthcare policy changes, as well as legal risks (if drugs end up harming patients). In addition, private insurers and pharmacy benefit managers, can sometimes force drugmakers to lower their prices in order to include them in their formularies. For example, in 2016 ExpressScripts forced Gilead to cut the price of its hepatitis C medications in order to remain in its system. This practice is designed to minimize generic/biosimilar competition and is part of what the FDA has called a “rigged system” it’s trying to change to lower drug prices. 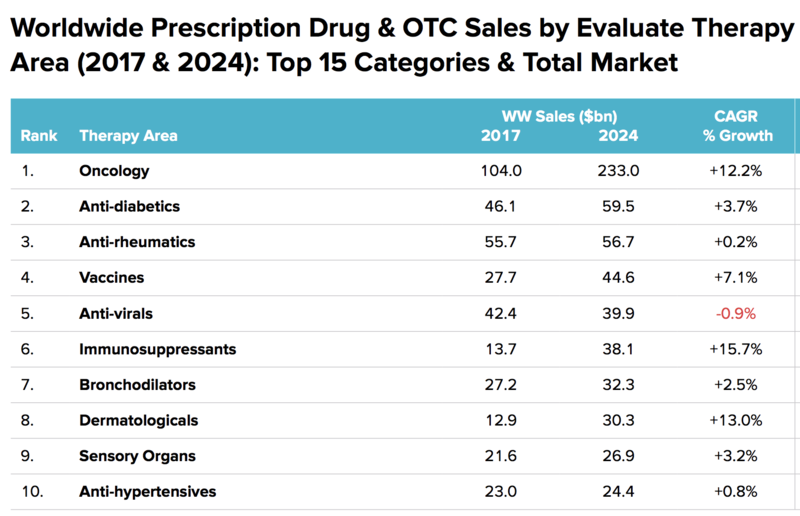 That’s because in the U.S., specialty drugs account for just 2% of drug volumes but 50% of total drug spending, according to the IQVIA Institute. Gilead’s entire product portfolio consists of specialty drugs, and its pipeline is similarly focused on high-margin products that could see far lower prices in the future should any of these proposed regulatory changes go into effect. Simply put, the drug industry is highly complex, and generally best left to more risk-tolerant investors. And with Gilead’s historically strong management team now being replaced with relative newcomers whose focus is on areas outside of the firm’s traditional circle of competence, the growth challenges facing this company could linger for the foreseeable future. However, in recent years the firm’s excessive reliance on hepatitis C blockbusters, which have seen a steady erosion in market share and sales, combined with its management turnover, means that Gilead now faces a less certain future. While the dividend appears safe given the company’s reasonable payout ratio and strong balance sheet, investors need to account for Gilead’s uninspiring growth outlook and the potential need for another big acquisition to improve its growth trajectory. After all, the clock is ticking with three of its leading HIV drugs (35% of sales) set to lose patent protection in 2021 and 2022.